When I stayed at the prestigious E&O Hotel in Penang recently, I was told of the hotel’s award-winning Pañpuri’s Organic Spa that offers organic and authentic therapies from across Asia. Nestled on the sixth floor of the E&O Hotel, Pañpuri is set with a backdrop of opulence of a pampering haven for those who seek moments of unwinding spa pleasures. 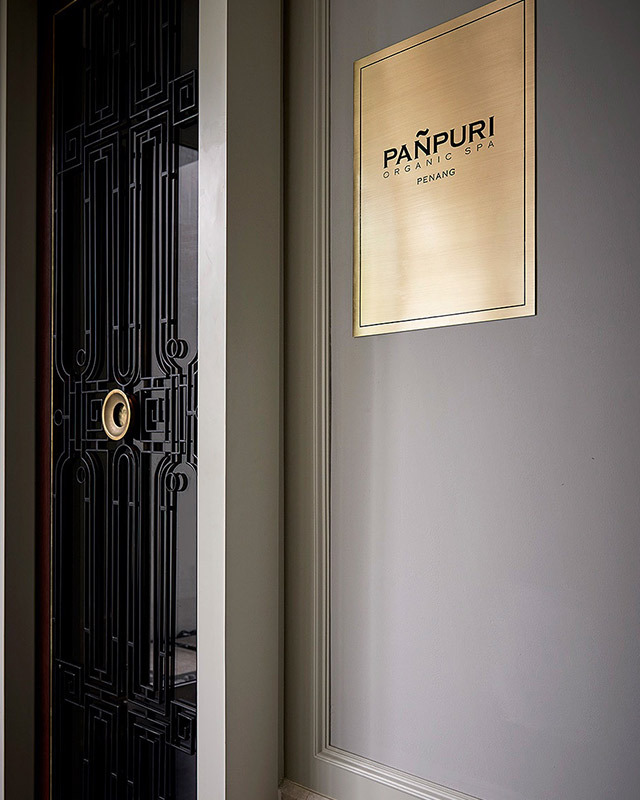 Pañpuri’s Organic Spa, established in 2003, originates from Thai heritage. Pañña means wisdom while Puri not only means a holy site, but also has the connotations of untying what is tied and making the unknown, known. It’s also one of the first and only Thai brand to use genuine “Certified Organic” ingredients in its formulations. With a list of impressive awards globally, Pañpuri currently has nine locations in Asia Pacific while their organic range of products is available across the globe extensively. The moment one enters, it was a tranquility of Zen with soft sweet greetings from the staff working at Pañpuri. A room designed with elegance of dark colours accentuated with gold trimmings and soft lite lightings to evoke a warm glow throughout the spa. One corner offers a consultation spot while the other has a long reception holds Pañpuri’s organic range of products. There is another built-in-wall cabinet holding more of Pañpuri’s exclusive products that contain hypo-allergenic and natural plant-based ingredients. Coupled with the skilled hands of Thai-trained masseuses, indulging in moments of solitary and serene escape from our hectic daily lives is utterly blissful and much needed. The professionals at Pañpuri’s Organic Spa will share their information with one to assist in making the right spa treatment for your needs. A quick chat and based on my preference of spa, I was told that their signature Mali Moonlight Soothing Massage would best suit to my needs. My 60-minute session combines Traditional Thai Massage, Aromatherapy, Reiki, and Acupressure techniques for elements of easement and relaxation. Before my spa session began, another staff had a consultation with me to find out all about my likes and dislikes when it comes to the session. Questions on which body part I prefer more or less pressure, any discomforts or preference I prefer is to make sure I fully enjoy my spa. I even get to pick my oil of choice from its lovely range. After a lovely drink and a cold towel to refresh up, my assigned masseuse – Cindley guided me to one of the available rooms out of five for my session. I passed one of the rooms and couldn’t resist peeking in. A couple’s room obviously, this one has a Jacuzzi and its own bathrooms and wardrobe. My room looked similar but without the Jacuzzi pool. Featuring twin massage bed, the room was minimalist but very contemporary with an air of serenity. Themed in dark shades offset with whites and accentuated with brass and gold through its finishing, my room has its own private steamed shower room as well. Cindley opened a box on the massage bed to reveal cottony plush slippers, disposable shower cap and other bathroom amenities. A bath robe made from organic material with a gold Pañpuri logo along with a brass bell was also placed on the bed for me to change into. As soon as I changed and gently shake the bell, Cindley appeared and led me to the velvety blue sofa where a gold covered brass bowl was setup along with some natural ingredients of an organic foot scrub. She placed a warm neck pillow filled with rice and other natural plant ingredients around my neck to soothe out my tension. Immediately, the neck pillow worked its magic like a charm. The warmness helped to ease out the tight knots on my neck and shoulder as I sigh with much bliss. She proceeded to use limes, kaffir lime leaves, natural bath salt and other spices for my foot scrub, gently massaging and easing comfort to my tired feet. As soon as that was done, I moved to my bed, all ready for my pampering session of Mali Moonlight Soothing Massage. I thought it was rather thoughtful of the spa to even put a bowl of pretty flowers floating on water beneath the head board that allowed me to rest. At least I am looking at something pretty and not just the floor. The room offers a glass window too with a view of the Straits and this was extremely pleasing to the eye. Resting well and leaving the world behind, I closed my eyes and succumbed to the masseuse’s skillful hands as she worked Reiki and Acupressure techniques to ease my body and mind. Needless to say, I dozed off while the evening sun sets outside. She applied enough pressure at all the right spots as per my consultation earlier. The aroma of my organic Thai Jasmine oil was gently massaged into my skin, allowing the air lingering around to be perfumed with jasmine scent. Even when she applied much pressure to my needed tight spots, I honestly didn’t even nudged or notice much, simply because I was in such blissful state of Zen. 60 minutes went too fast and soon my spa session was done. As she finished with a light head massage, I couldn’t help but to wish for more time for this session. I did a quick wiped down and changed back to my clothes before I was ushered to another room. This one was warmly lit and has lovely armchairs set along with more wood and brass finishing. Soft music echoed subtly in the background and I was told to enjoy my hot cup of ginger tea along with some dried fruit pieces. Thanking Cindley for her services, I sighed in contentment that this session was literally a much-needed one from my usual stressful life at work. The Mali Moonlight Soothing Massage is really ideal for those who wants a relaxing yet therapeutic massage. Leaving the Pañpuri’s Organic Spa, I vowed to return for other sessions should I head back to the E&O Hotel in Penang. This time, I’ll make sure to sign up for their 90 minutes one!